A high priority for a local small business or a blogger is to locate and identify which related geo-targeted or niche bloggers are interested in collaborating. You can do that by researching or by getting the word out using social media. If you do not already have a strong online and social media presence, using social networks to reach bloggers can be a real challenge. One solution is to use the reach of established influencers. Here is how we can collectively use that reach for the greater good of all. While we can not publish an unlimited repetition of similar posts because our readers would soon tune out and miss what could benefit them most, we can create pages (instead of posts) for each niche and location and then publish a summary of those pages periodically in a post. Small Businesses can join related bloggers and benefit from Blog Outreach. I encourage you to consider becoming a blog collaboration leader for your niche and location. Publish a post or page on your own blog linking to and describing the best related blogs of interest in your geographic area and niche. The more data individual bloggers create, the faster we can pull the information together and multiply our efforts. This is not as difficult as many bloggers believe. I am happy to assist and provide examples and there are others who have the skills and know-how to share what works. The best example of this to date is the work done by Rohan ( Twitter @365thingstododc ). I would have never guessed there were so many food blogs in one place. If he can find 44 Washington DC food related blogs, surely each one of us can find the top four other blogs in our own locations and niches. The more serious bloggers you can pull into your collaboration, the more influence you will all have; however, all you need is a core group. I encourage other bloggers to seek out and publish a post linking to the best other blogs in their niche. Use Twellow, Twitter search, Blog Directories, your favorite search engine or the blog search function on Zuula. Doing this will raise their visibility and search engine positions and your own! I will be researching and collating this data; however, there is only one of me. Bloggers who contribute their own research benefit from being promoted early and often and used as examples as Rohan’s and Kelli’s blogs already have been multiple times. Both benefited from having links in the Small Business Advice interview Pace Lattin published about GrowMap on the PR8 blog Technorati. “Bloggers who are wise enough to collaborate with each other will end up with the lion’s share of the traffic and be able to do greater good. You will grow your lists faster and when you have larger lists you will be able to negotiate special deals to offer your readers – making your blogs even more popular and influential.” ~ Gail Gardner in a comment to Stephanie Suesan Smith, Master Gardener putting together a Gardening Blog Collaboration. You are invited to use this blog’s reach and social media influence by publishing guest posts about your collaborations and to have pages created here targeting your best anchor text linking to each blog involved. I look forward to hearing from you all. Leave a comment in this post (or the others related to it) or use my contact info. I think you are a great example of this as well Gail. You practice what you preach. You are a great starting/central point to learn more about blogging and growing small business. Not just information but also the whole big web around you with other great blogs. Don’t really need much else. And look how guest posting has worked out here. It is a lively place with some great guests posts on growmap.com every now and then as well. A lot of great value here- thank you! I am currently testing how the various local search directories handle URLs and will eventually publish my results. It is true that some only use the base URL so if you had content for multiple businesses on the same domain that won’t work as well as them each having their own domain. What I recommend for businesses that don’t have their own blogs or Web sites and don’t want to deal with having them is to have content published about them on an established site, buy a domain name and redirect that domain name to that content. Then use the domain name in your listings, on your business cards, etc. By doing this you can control what appears on your domain and more importantly if you later decide you want your own site or blog you can redirect the domain and not lose any of the promotional work you’ve done and not need to reprint anything that has your domain on it. I acknowledge the idea of collaborating with fellow bloggers and sharing information in order to fulfill the profitable goals. Relationship with others will I say an important tool to succeed especially when you are a small businesses-bloggers who want to build own bases. I hate the idea of competing others and at the end resulted of being a crap. Make some sense guys and widely open your thoughts. Thank you for sharing this information to us! It reallly help us a lot. Hi there. Thanks for sharing this for us. And thanks for encouraging us too to get the opportunities. This collaboration thing seems to be interesting, but I am a little concerned about the repercussions! I mean, it would not be ease to collaborate with your competitor and compete with a third competitor then. If we merge our data and everything, then there would always be an issue that this traffic is because of my idea! I wonder how can it be a hassle free process. With two leaders in one company, would things work! Please suggest. As blogger, we aren’t really competitors to one another. Most bloggers don’t have a lot of overlap in our audience. I am new to the blogging scene, so any hints and tips are welcome. My new job has brought me to this area of the worldwde web and I suppose I never realised how vast it is. I can see myself spending a lot of time trying to keep updated. Blogging well is far more complicated than most realize. There is plenty on this blog and on other blogs I recommend to get you started and you can always ask questions in the comments or by tweeting @GrowMap. Great post and a very well written explanation of what guest posting can bring. I think you very neatly outlined the reasons why guest posting is a good thing. Yes, in this day and age of trying to get backlinks and rank in search engines people are often forgetting the power of actually building relationships with people and if a few people with similar blogs can work together then the impact on site profitability can be immense. I often use guest bloggers on my site as it keeps things fresh and interesting and also builds a great sense of community. I also post on other blogs and find it helps with my traffic. Thanks for a great post. If you ever have the time you know you’re always welcome to guest post here. Just let me know and I’ll add author access for you. First of thanks to @Benjamin’s comment. 🙂 It’s give and take, show your sincerity and don’t hesitate to give more in return. This is a good idea. Collaborating with your fellow bloggers and sharing strategies or techniques in order to succeed. But what do you think a neophyte can contribute to this project? Guest posting is good. Blogging can be a source of income only if you do it with dedication! I’m having good success with finding guest post opporunities using advanced google search queries. Guest posting is somewhat create and build relationship to other bloggers and that’s what make the essence of unity to all bloggers. Unity is more like it… I hate the fact that bloggers compete and sometimes pressure themselves and result into trash. Collaboration is a sure winner. Andrew would love you to read ..How Many Man Drawers Do You Have? I don’t blog for long time. Your information and the dicussion helps a lot. I’ll have a look of myguestblog.com and apply it in the future. Working together with fellow blogger, can really open a lot of opportunity. It open roads for friendship, intellectual ideas . You can not only profit from guest blogging on other blogs or by fresh content on your blogs, but also from working together with the blogger or writer for example when exchanging mailing lists. It is best not to exchange lists because that will seriously annoy many people on them who will see you as a spammer. A better strategy is to have other bloggers introduce you to their lists and encourage them to opt in to yours. I think one of the great things about this is that is allows small businesses (bloggers) to work together to build their base. It’s always a good idea to work with others, find common goals. Pace Lattin would love you to read ..Why Are Brand Media Buyers So Damn Lazy? It is essential for bloggers to build collaborations around their locations and their specialties because once you know who the key players are it becomes much easier to spread the word – especially when they are of any urgent nature – and support important causes. This is easier done BEFORE their blogs become difficult to locate in search engines; however, thanks to CommentLuv and tools like Twellow they can still be found even if they disappear from Google. It just won’t be as easy to tell which blogs have readers and which don’t – but I recognize quality upcoming blogs with few readers as important as those already established. Imagine being able to easily find large numbers of blogs that are interested in just what you have to say? THAT is what we are building here. It takes time, but once it is done we can quickly accomplish our goals. You know I’m sending in my content, its great to see people doing good things to help others..thanks for all the help. I know you’re on board with what we all need to do. I can always count on key bloggers to ‘get it’ and their assistance in spreading the word and helping others. Check out my Twitter Best Practices post to grow your influence on Twitter – especially steps #3 and #4. I like the http://myblogguest.com/ community! Here its easy to find related blogs to write guest posts for! I´m very new to guest blogging, but I will apply it to my marketing efforts for sure now! 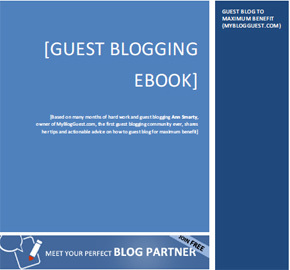 Yes, Ann has created a very effective community for guest blogging in MyBlogGuest and her new ebook (offered in this post by clicking on the image at the beginning) is a must read for those serious about guest blogging.